Uncategorized | girl. food. blog. I'm just a vegan girl who loves cooking (and eating and sharing the results). I believe everyone should have access to fresh, healthful food that is prepared well. Join me as I explore ethnic foods, local restaurants, new recipes, and food history. We'll have fun! My friend C and I were indulging in a late-morning sushi fest the other day. As were ooohed and aaahed about how good our rolls were, we reminisced about our childhood days back in the ’70s and shook our heads at how unhealthfully we ate back then. We were good Midwestern girls, and naturally, were raised on standard nightly feasts of “meat and potatoes” – pot roasts, pork chops, steaks, (and my parents’ particular favorite, kielbasa). That’s when C mentioned casually that her mother frequently made her favorite dish, manhattans. For a crazy split second I thought C was talking about the cocktail Manhattan (which is silly – what the heck were they doing in central Indiana? ); but then she explained to me that “manhattan sandwich” was a regional specialty that they indulged in quite often. I’d never heard the term ever, even having lived in Ohio, so I was intrigued. potatoes and gravy. 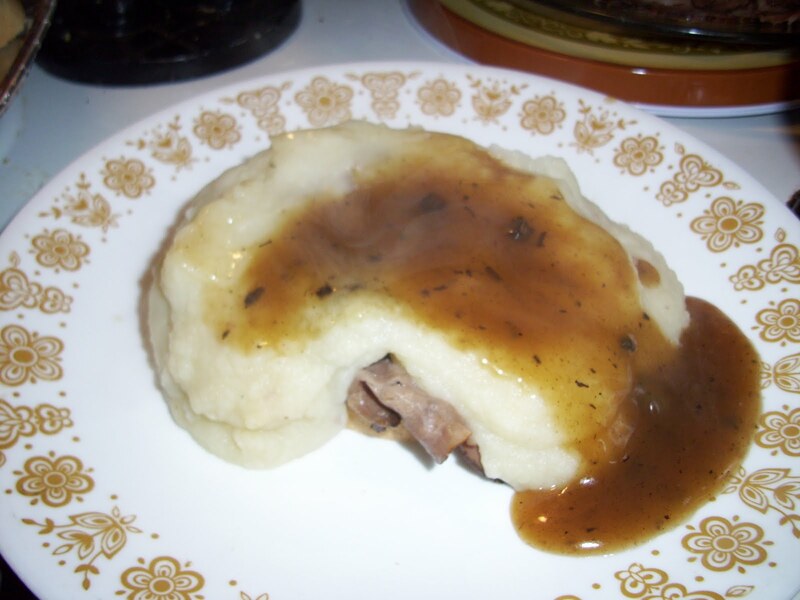 C’s mom took it one grandiose step further: she would begin with white bread, then add store-bought boil-in-bags of Banquet roast beef, mashed potatoes, and then another slice of bread, then beef, and keep layering it for that terrine effect. C remembers it fondly as one of her favorite dishes ever and she misses it – and her mom – greatly. Poking around on the web, I found that a smattering of Indianians (and a scant few Illinoisians) still wax fondly about the “Beef Manhattan,” which apparently is in danger of becoming as extinct as the passenger pigeon. PS: Manhattans have nothing whatsoever to do with New York City! PPS: Confession: I used to love the boil-in-bags of Chicken a la King. Yeah, I know. I’ve since made a vegan version which is much, much better! Look. Look at this spicy, sweet Asian sauce. You know you want to pour it all over your hot rice noodles, don’t you? This Chili-Lime sauce was invented by Tess Challis, author of Radiant Health, Inner Wealth. Tess is an enthusiastic Colorado vegan chef who is mindful of the health benefits when pairing ingredients in her recipes. Her book is a fun read, and you’ll be bookmarking several recipes to try at a time. 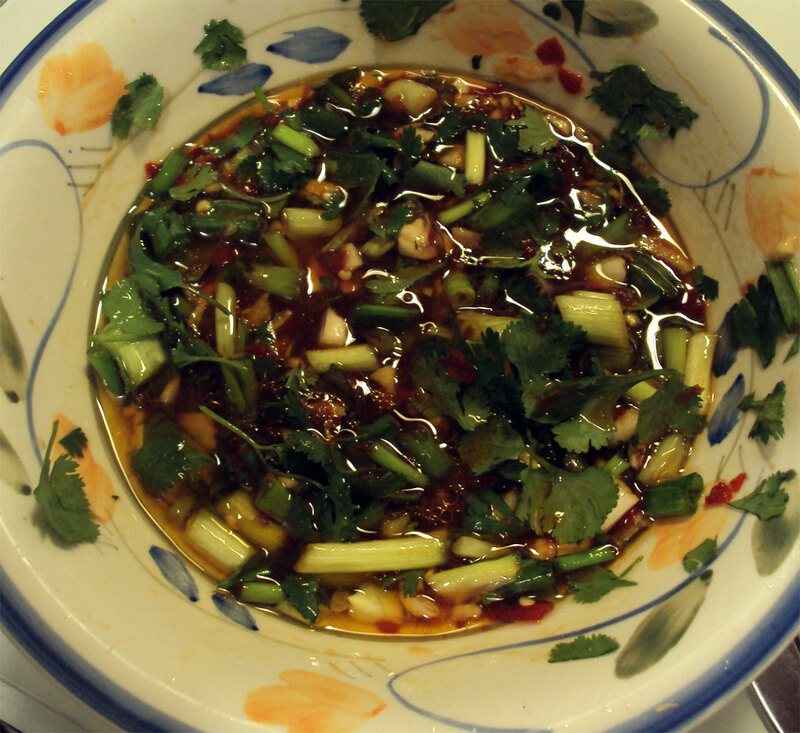 My Chili Lime sauce went over rice river noodles and at the end, I added crushed peanuts. The recipe is a simple take on Thai cuisine without a lot of fuss. River rice noodles cook up quickly and I like their authenticity. Plus, they’re cheap: $1.19 for a 1 lb. package. And, as Tess said, you can eat this dish hot or cold. 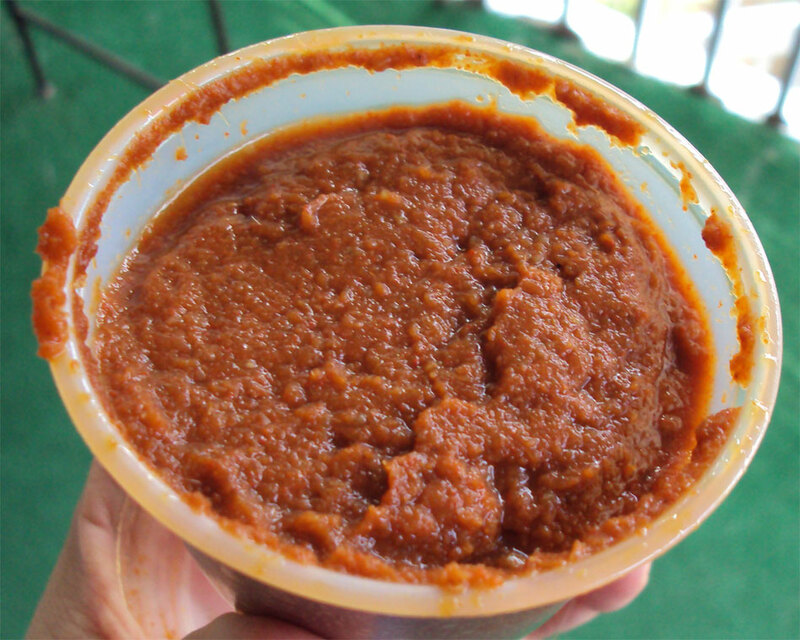 With my addition of sambal oelek, I like to eat it hot – so it makes it even hotter! I don’t know about you, but when the temps here in Florida hit high 90s with loads of humidity and steam is rising from the pavement after a storm, I wilt like a spinach leaf left in the trunk of a warm car. Which means I don’t really feel like the effort of cooking a hot meal. This is where salads step up and take center stage. 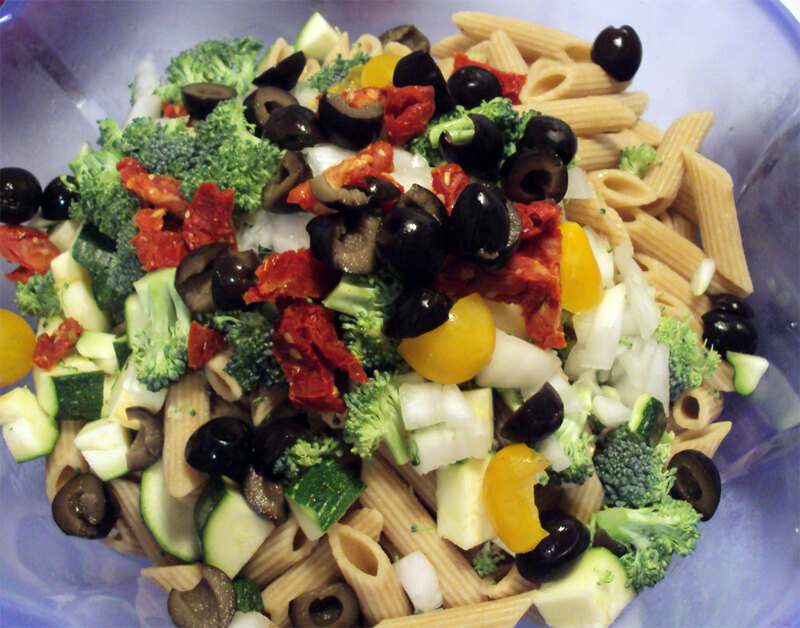 Pasta salads make a nice meal on their own, lunch or dinner. Whether you serve them with a pitcher of iced tea or a pitcher of sangria, these dressy salads are versatile, colorful, and most importantly, healthful. See this innocuous little container? It holds a fiery mass of Thai red curry, the power of 1,000 suns, and the ability to make your mucous membranes whinge for hours on end. It was purchased at the Wat Tampa, at their weekly Sunday open market. Looking for some hot stuff, baby? For a mere $1, you can get freshly made (not canned, thank you) red or green curry, lovingly prepared by the temple members (who also put on a fabulous food festival, but we’ll come to that later). I eventually paired half this container (though I could have easily used a third) with coconut milk to make a heat-seeking veggie curry. Wowsers. Proceed with joyous caution, and have a glass of milk at hand to soothe the savage fires that will eventually come. Yes, I know it’s July and not anywhere New Year’s Day…but this Creole Hoppin’ Jon recipe from Bryant Terry hits the spot any time of year, when you’re craving hearty, spicy, healthful vegan food. 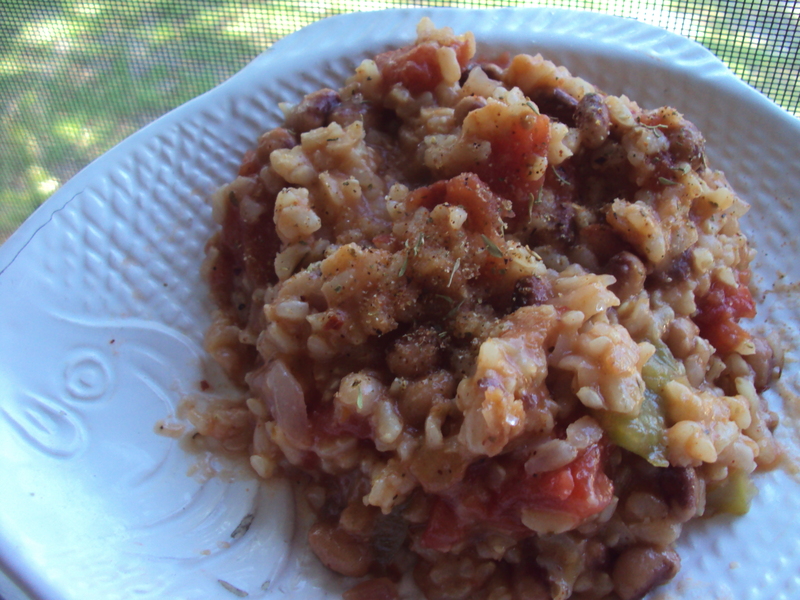 Loaded with black-eye peas, brown rice, and tomatoes, it makes a great side, or as I had it, a main dish. Eat it on the porch with a big glass of iced tea and savor the summer. 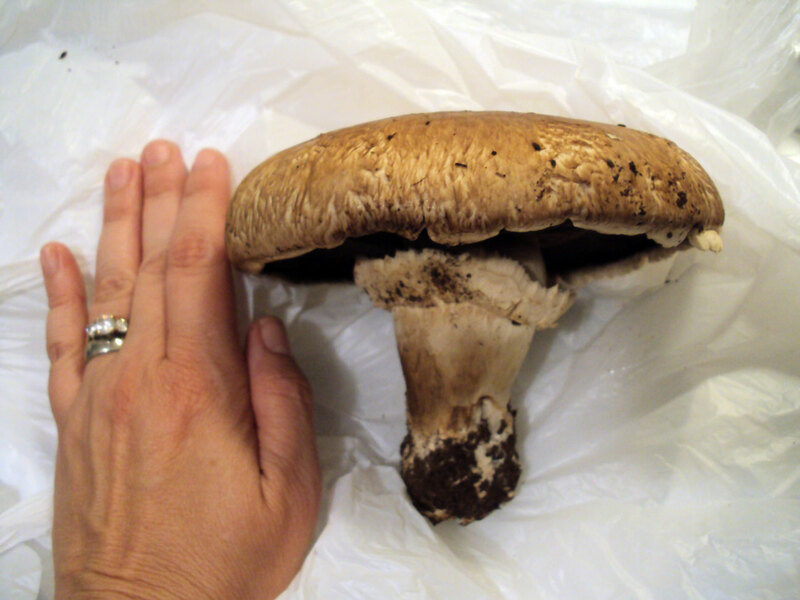 In the previous post, you read about how I discovered a new local market and purchased a humongous portobella mushrooom for dinner. Well, have a gander at the final result: that darn ‘shroom, stuffed to its gills with freshly chopped garlic and feta cheese and topped with a from-the-garden basil leaf, then broiled in a 380 degree oven for 15 minutes. The result? Bliss. Sheer, cheesy, mushroomy bliss. Clean out the underside and stem of the portabello with a spoon. Be certain not to gouge the mushroom or scrape too much out. Chop fresh garlic. 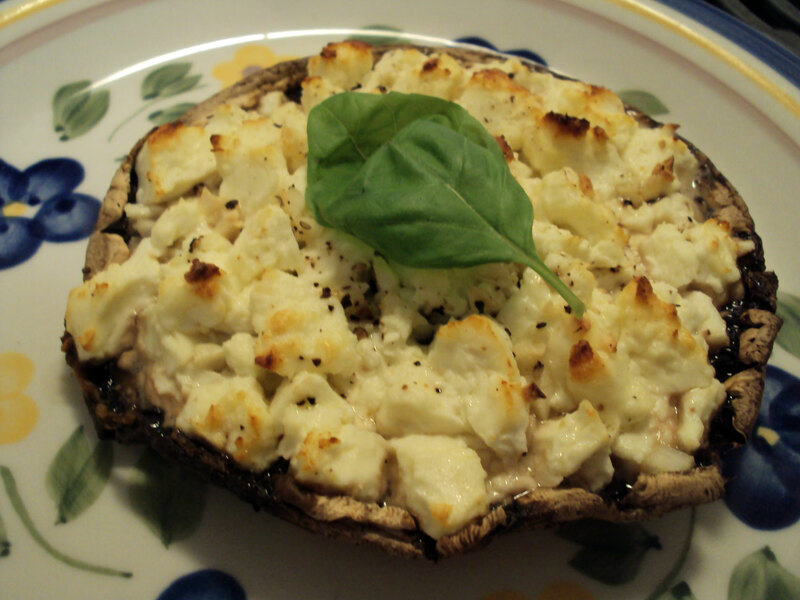 Fill mushroom with as much crumbled feta as it can hold, then sprinkle the chopped garlic on top. Spray a baking dish and place the mushroom in the dish. Bake at 380-385 degrees F for about 15 minutes or until the mushroom is soft and beginning to release its juices, and the feta is becoming slightly browned on top. Garnish with a fresh basil leaf (optional) and cracked black pepper. Enjoy! The nondescript exterior. But oh, the yummies inside! On the way back from an IKEA shopping trip, my driving pal impulsively decided she wanted to stop at the Spiros Pasadena Produce and Deli to pick up a Greek salad for her supper. We’d both separately driven by this little store, in an even-smaller strip shopping center in South Pasadena, but had never bothered to actually stop in. Now, on a later Saturday afternoon after a frenzied day of shopping, we were both glad we did. It’s funny, too. We had had lunch together, earlier in the day, fantasizing about where in the world we would go if we had the money. She said Greece; I said Italy. We both agreed that both places would be a blast if for nothing other than the cuisine! And I’ve always loved Italian markets. 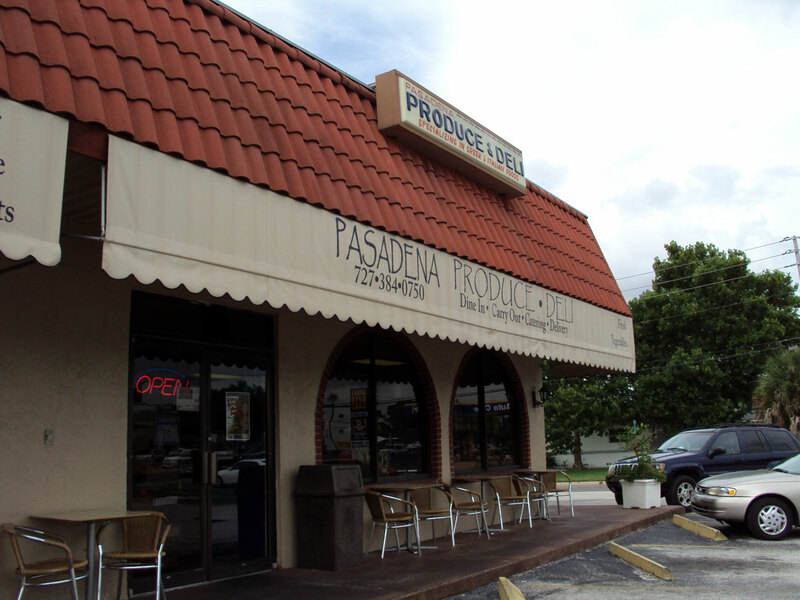 Growing up North, I remember my mom stopping at a large Italian speciality deli in a (wait for it….) strip shopping center in Cleveland. I distinctly remember the smell of olives and freshly cured meats; we would usually walk out with bread and real Italian tomato paste that came in a squeeze tube – far superior to anything in a can on an American shelf. You can also get Greek and Italian dinner classics – moussaka, lasagna, roasted lamb. What stunned me were Spiros’ produce prices. I couldn’t believe that this tiny shop had better-than-competitive prices than the giant chain supermarket in the next parking lot. Fresh lemons, 4 for $1, heads of garlic, the same; healthy-looking eggplant, lettuces, carrots, tomatoes of all sizes and onions, jicama, Swiss chard (my new, recent love), broccoli, and mushrooms. What caught my eye first were the size of the portobella mushrooms, and it was then and there that I constructed a dinner in my head. At the deli counter (I smelled it before I saw it!) they offer loads of yummy olives, and my favorite, feta cheese. The feta prices per pound were reasonable, and I knew that feta was what I wanted to stuff my giant portabello mushroom with. I ordered a half pound, and it came nicely double wrapped in paper and plastic wrap: a nice, fragrant, healthy-looking chunk of delicious cheese that puts “store-bought” to shame. 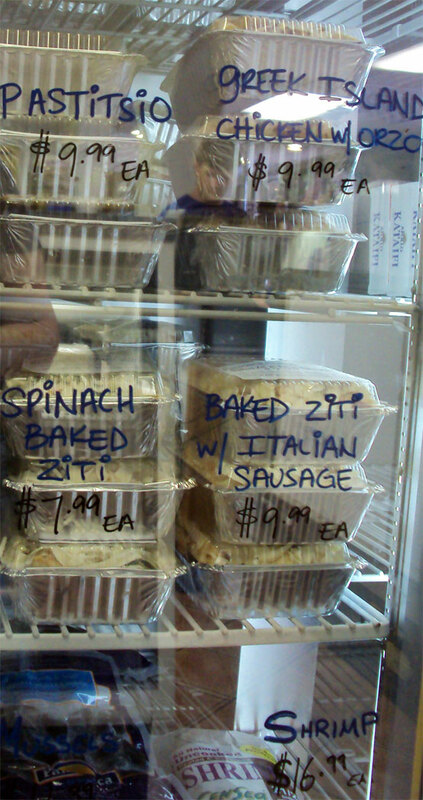 If you’re feeling lazy or are in a hurry, Spiros pre-makes their yummy Greek-Italo dinners for your convenience: just take home and reheat. Grab a bottle of wine and some baklava from the deli, and you are good to go. Bliss! 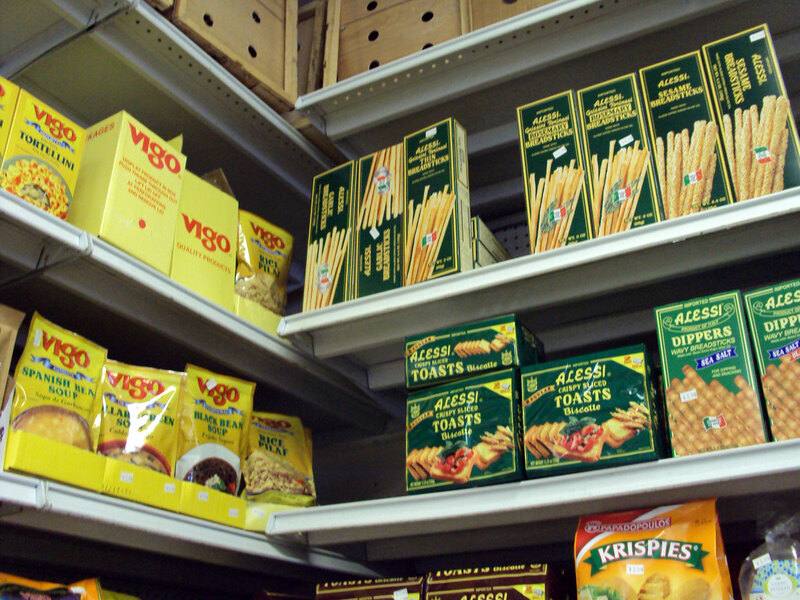 My favorite part of Spiros (besides the cheese) is the dry goods: Alessi brand foods, like dried soups, espresso, ladyfingers, cannoli shells, and marinara sauces. Alessi (based in Tampa) always makes quality stuff and it’s painfully authentic Italian. (If you’ve never been to the Alessi restaurant in Tampa, you owe it to yourself to pay a visit.) Spiros even offers pignoli nuts in bulk – how cool is that? Vigo & Alessi - Tampa homeboys. I wound up with just the half pound of feta, giant mushroom, and fresh head of garlic, but resisted temptation for other things (which is tres difficulte for me!). And let me tell you: that fresh feta was AMAZING. Perfectly salty but not too, it complemented the garlic and the portabello as I grilled the three together. When I want my next feta fix, it’s going to come from Spiros (and as they’re open 7 days a week – not made hard at all). You can find Spiros at 6801 Gulfport Blvd South, in South Pasadena. Go – and indulge. I'm just a vegan girl who loves cooking (and eating and sharing the results). I believe everyone should have access to fresh, healthful food. Join me as I explore ethnic foods, local restaurants, new recipes, and food history. We'll have fun! I want to follow this girl!